Bright red-orange with glass luster this is an eye catching arrangement. Crystals reaching over 2.5 CM in a pile up on a small amount of gossan matrix, this is very attractive and somewhat unusual for this find. Most crystals here have a jagged, multiply re-crystallized thin edges, There is damage here as usual in these very slender and delicate blades, but the presentation is still good overall. A very good value at this price if you dont need absolute perfection, but still like a good displayable specimen. A small miniature with big color and fine form. 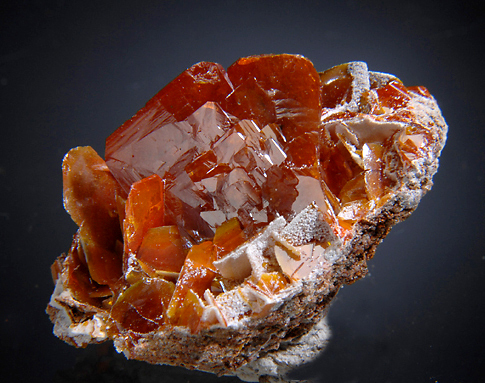 Rich red -orange crystals over 2 cm across with lusterous faces show excellent growth structures and "faceting". For such a delicate form the condition is excellent, however there is minor edge chipping and some broken tiny crystals as seen in the photos, but the display side presents well and is excellent for the locale. Krushev Dol Mine, Madan, Rhodope Mts. The mines of Madan have produced some incredible and strange Galenas. This is certainly one unusual and attractive example. Galena crystal faces with growth hillocks and hoppered zones are like modern art, decorated with calcite rhombstacks and drusy aggregates. The Galena is mirror bright with gleaming luster. 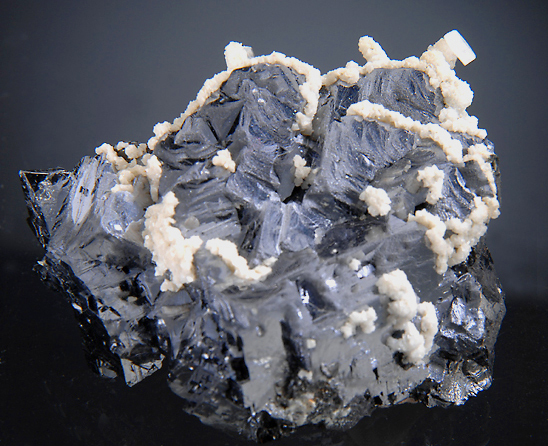 If you like interesting and esthetic galena this will be a welcome addition to your collection. 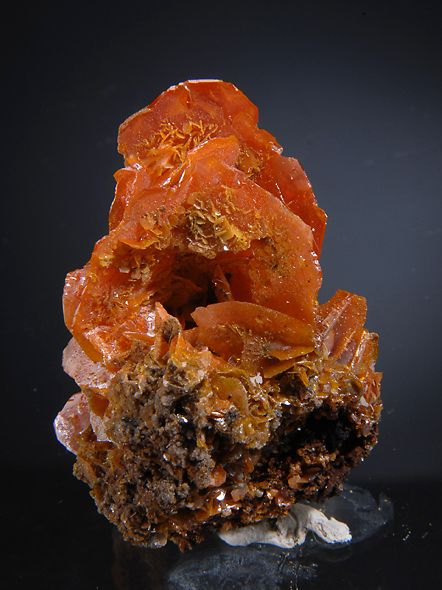 Brilliant red-orange wulfenites to 2.3 CM are packed together on a small shard of gossan matrix. Fantastic luster and overll very eyecatching! For such a delicate piece this is in rather good condition, the largest prominent crystals are nearly pristine. There is some typical broken edges on the smaller crystals and at the edges, but this can be displayed to feature the better areas. 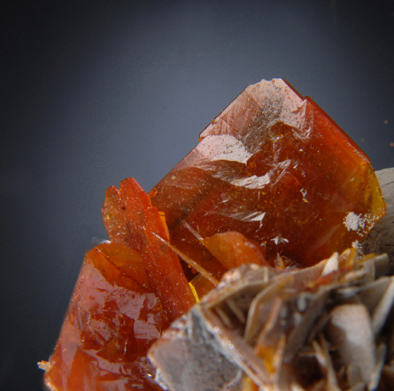 An excellent example of this style of Wulfenite and unquestionably a very attractive specimen. 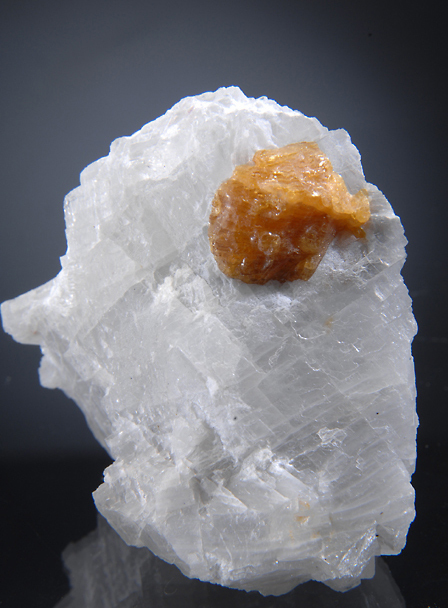 A single orange brown Chondrodite crystal of over 2 CM sits on contrasting Calcite. The matrix also has a few micro spinels scattered on it but the Chodrodite is the main event. A very sizable and undamaged example with the typical melted look for this region. These have not been available for some time, and this piece is one of the best I have seen for Chondrodite from Mogok. 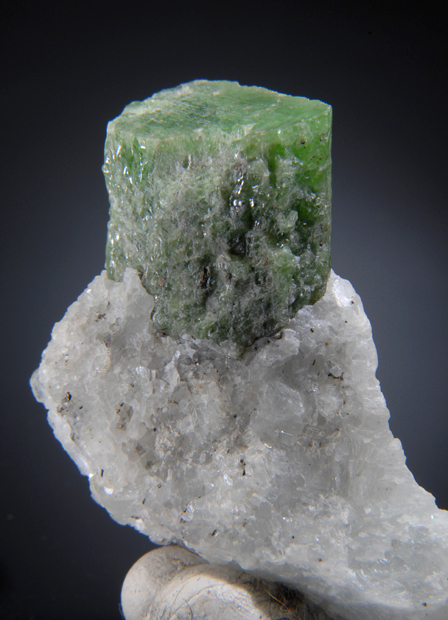 A single sizable (3 CM) crystal of rich green Chrome tremolite sits on a calcite matrix. The crystal form is impressively sharp for one of such size, this is not the typical "blob" of tremolite! Great color and gemmy on thin edges, these are not common in general and rare in such aesthetic specimen. 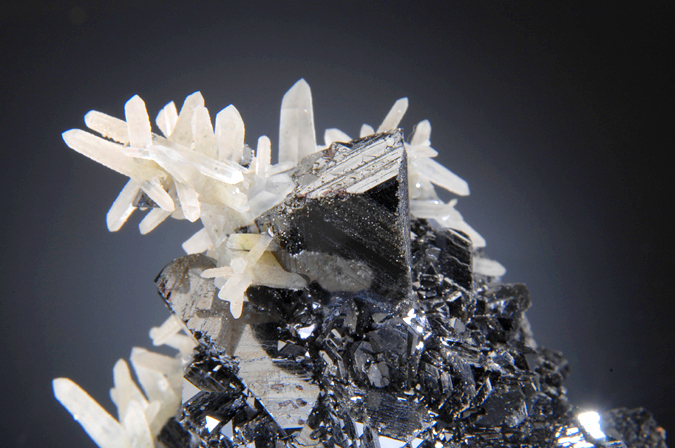 As a rule, black Sphalerite is not a very desirable mineral, but this one is something special! 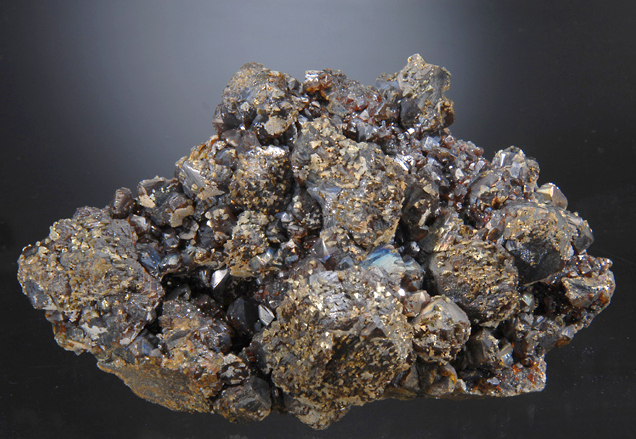 Lusterous and sharp glassy Sphalerites to almost 3 CM are decorated with treelike growths of slender quartz crystals. In great condition and with killer esthetics, the Sphalerites are well positioned and show complex growth hillocks on many faces. Careful examination finds only minor edge wear on some sphalerites, nothing distracting from the impact of this piece. Great for this specie and exceptional for this famous mineral region! A very old and very fine Tri-state classic! Ex collection of the Arizona-Sonora Desert Museum, This is a true top shelf specimen. Sphalerites here reach to 4 CM and are exceptionally well formed. The smaller crystals are a fine ruby red (rubyjack) while the larger ones are darker and coated with chalcopyrites. Some faces are noticably irridescent and over all the luster is outstanding. The only damage is at the outer edges where it would be expected, the display face is pristine, three dimensional and very esthetic. The old Tri-state area produced a lot of materials in its time, but this quality was excellent even in its heyday.